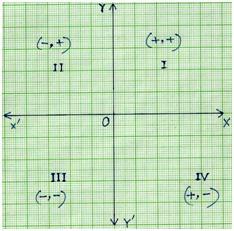 Learn all four quadrants of a coordinate system. The plane of the graph paper is divided into four regions by the coordinate axes and the four regions are called quadrants. What are the Quadrants in the Coordinate Plane? ● The region XOY is called the I quadrant. In first quadrant, both x and y co-ordinate are positive. ● The region X’OY’ is called the II quadrant. In second quadrant x co-ordinate is negative and y co-ordinate is positive. ● The region X’OY’ is called the III quadrant. In third quadrant both x and y co-ordinate are negative. ● The region XOY’ is called the IV quadrant. 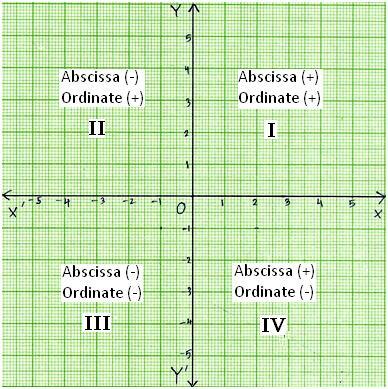 In fourth quadrant x co-ordinate is positive and y co-ordinate is negative. The table will help us to remember the region of the quadrants and theirs signs of coordinates.